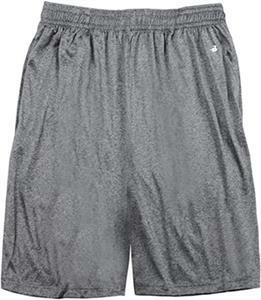 Badger Sport Pro Heather Performance Shorts. 100% Heathered polyester moisture management/antimicrobial performance fabric. 2" Covered elastic waistband & drawcord. Two deep side pockets - Double-needle hem.Badger heat seal on left hip. 10" Inseam. Waist (relaxed)/on the half 14.25" 15.25" 16.25" 17.25" 18.25" 19.25" 20.25"